The earliest scheme for a railway line passing through the parish was the Birmingham and Gloucester first projected in 1824, on a route surveyed by Brunel. However the cost of his line was considered too high, and in 1833 Captain Moorsom surveyed another route bypassing all towns on the way, much to their annoyance. This scheme went ahead, being a narrow gauge line, but linking south of Gloucester with the broad gauge line to Bristol. Had Brunel’s survey been accepted Dodderhill would have had a broad gauge railway running through it. The line was opened between Cheltenham and Bromsgrove in 1840. 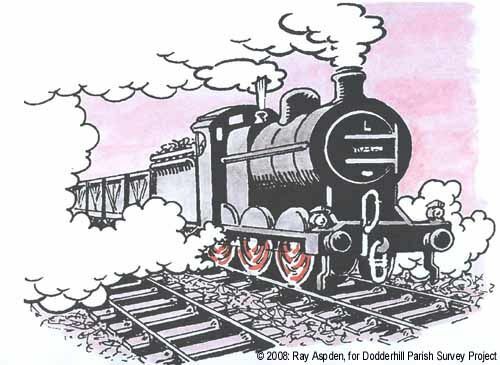 The station built at Stoke Prior – actually Stoke Works – was within Dodderhill parish. The other line in the parish joined the mainline at Stoke Works, coming from Droitwich where it linked with the Oxford, Worcester and Wolverhampton Railway – known as the Old Worse and Worse! The route was incorporated 4th August 1845, and the line from Droitwich reached Stourbridge on 1st May 1852. For the first time Droitwich salt, and later Stoke salt, could be sent by rail to the Severn ports and to the Birmingham area. Both these lines are still working. North of Stoke junction the line continues up the famous Lickey incline. One interesting point is that a station called “Dodderhill” appears on a Birmingham & Gloucester list of 1841. Our research of maps places it north of the bridge at Astwood Lane.